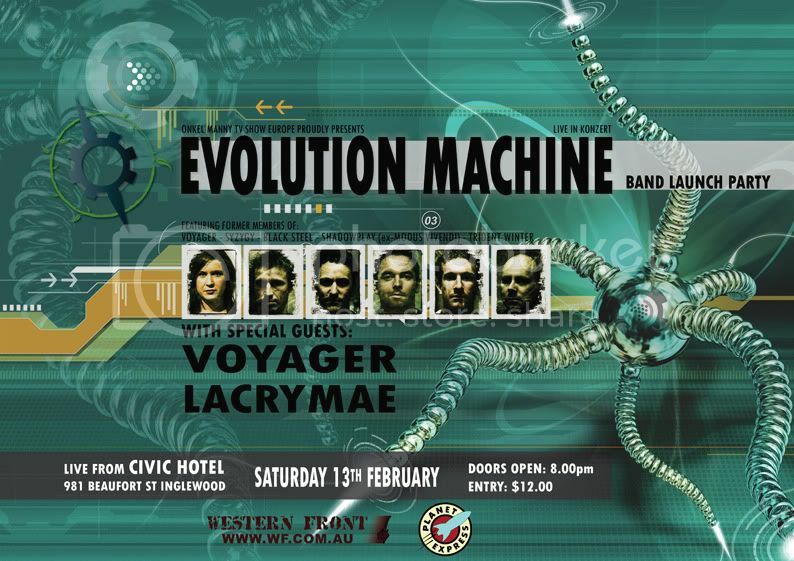 EVOLUTION MACHINE live @ The Den (Civic Hotel) this Saturday!! With Fear of Comedy, Define My Addiction and Writhe. With the lovable Dan Grainger filling in on the drums. Just a heads-up in advance to avoid possible gig clashes. Support bands to be announced. Metallica are said to be touring Australia and New Zealand in November 2010. Is this true or some Aprils 1st joke? After the March 23, 2010, release of their new album, Sting in the Tail, and a three-year mammoth tour, which will take them across five continents, one of the most successful rock bands in the world, Scorpions, will be ending their career. ...here's hoping they make it to Perth! Just thought I should throw in a quick post to avoid a clash. I can't see any gigs happening Saturday 5th Sept (apologies if there is), so thought I'd post this in case anyone is interested.